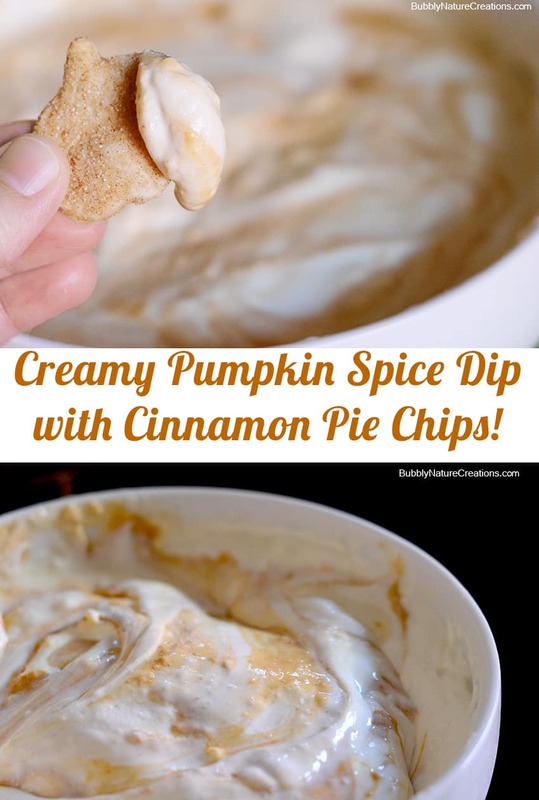 I love making fall flavored desserts to share with friends and family. I don’t think there is anything that tastes like fall as much as Pumpkin Spice. 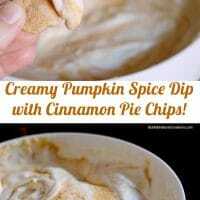 I make this Creamy Pumpkin Spice Dip with Cinnamon Pie Chips using Nestle Coffee-mate Pumpkin Spice Creamer! You can make a big batch and serve it to guests or package individual sized portions for gifts. What better way to connect with friends than with a Pumpkin Spice gift each year? Love it! 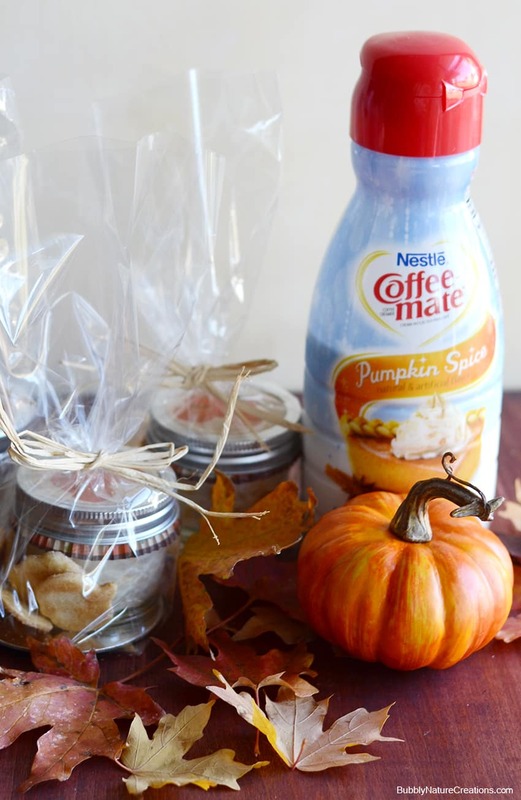 Nestle’s Coffee-mate Pumpkin Spice Creamer always tastes great in my coffee so I knew it would also be great to use for recipes! I like to make a cup when friends come over because it reminds me of a fancy coffee house flavor! To make a great cup of coffee using the creamer I like the coffee a little on the dark side and then I add enough creamer until the coffee is a creamy tan color. Yum! The taste of this dip is crazy good! 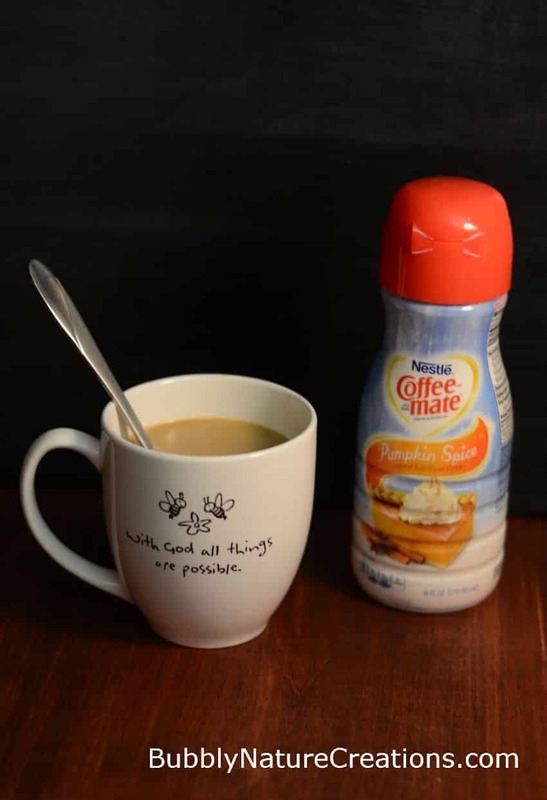 I love the subtle hints of Pumpkin Spice that the Nestle Pumpkin Spice Creamer gives to it. For the individual portions just use the 4 oz. 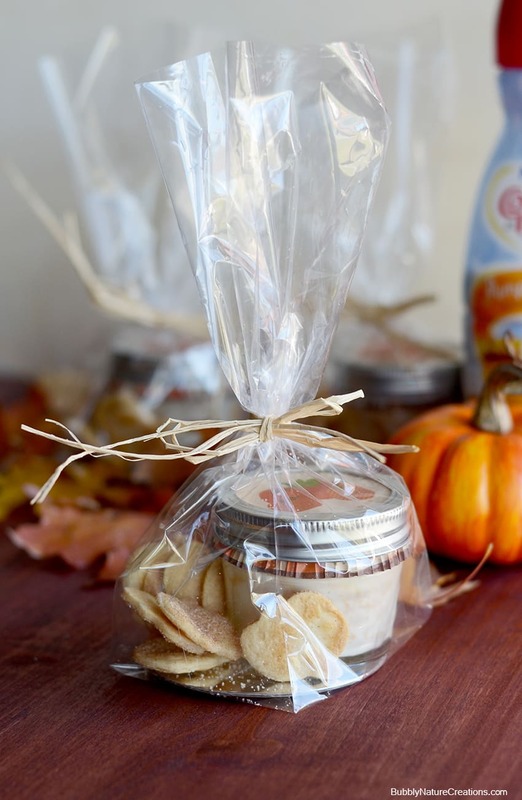 mason jars and fill it with the Creamy Pumpkin Spice Dip. I used a cupcake liner before I closed the jar to make it a little more decorative. Then just put the pie chips and the jar of dip into a small cellophane bag and tie it up! Perfect to give to neighbors, friends and family for the season. Beat one package of cream cheese on high until the cream cheese is smooth and softened. Add pudding mix and slowly mix in 1 cup of the Pumpkin Spice Creamer until mixture is smooth. Set aside in refrigerator. In another bowl beat the other package of cream cheese until smooth and softened. Then add sugar and rest of Pumpkin Spice creamer until mixture is smooth. Pour second mixture on top of the first mixture with the pudding. With a spoon stir the two together until you have a "swirled" effect with the two mixtures. Take the pie crust dough and roll it out. Sprinkle Cinnamon Sugar over the whole surface. Take a cookie cutter and cut out shapes or cut out strips from the pie dough. Place the strips or shapes onto a cookie sheet and bake at 350 for 7 to 10 minutes or until lightly browned. Serve the dip alongside Pie Chips. Enjoy! Previous Post: « Airplane Propeller Banana Snack! So creative how you used the flavored coffee creamer, Rachel. And, the little gift idea is just adorable! Already pinned!